House of Debt > Debt Analysis > Emerging Market Nightmare? Hyun Song Shin (@HyunSongShin) of Princeton University (Atif’s colleague at the Bendheim Center for Finance) has been doing some terrific work on a potential emerging market crisis. His big worry is the rise in non-financial corporate debt in emerging markets, and the important role that bond managers have played in buying up this debt. 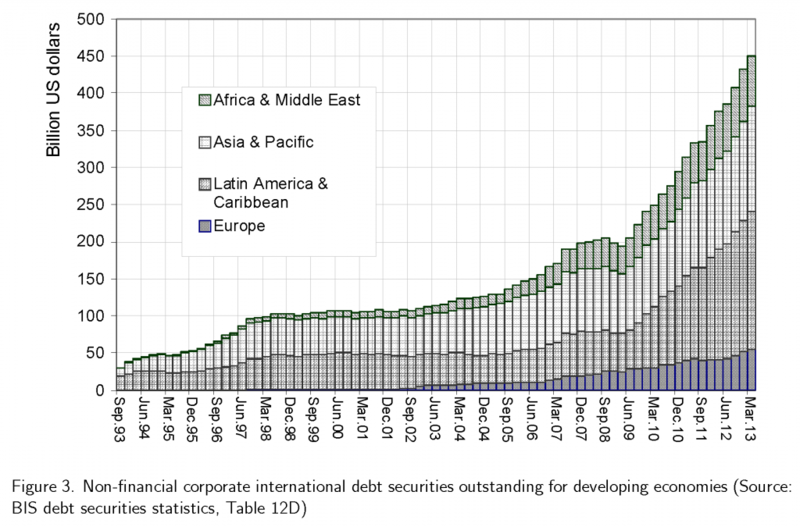 One of the points Shin makes is that a lot of this debt has been raised by emerging market multi-nationals outsideof their home country – thus bypassing their local regulatory authorities. It is a kind of carry trade done by the big boys of emerging markets: keep deposits at home to earn higher yield on corporate deposits in local currency, and borrow in dollars at very low rates in London or Hong Kong. Of course doing so exposes the corporations (and their economies) to exchange rate risk. This is an old story – remember the East Asian crisis? A rise in the borrowing cost for emerging market companies. See his slides for more details. His analysis points to the inherent dangers of debt in emerging markets. A reliance on debt – especially debt denominated in foreign currency (i.e. dollars) – exposes emerging market economies to run risk. We typically associate such run risk with leveraged financial institutions, but Shin is arguing that bond managers may also run if things go sour. The dangers of debt are, of course, the focus of our book due out in May.